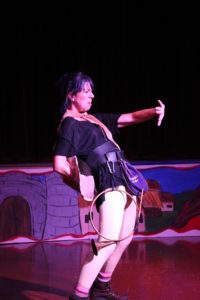 For two weekends – July 22-31 – Robin Hood took audiences to Sherwood Forest for an adventure with Robin and his Merry Men. 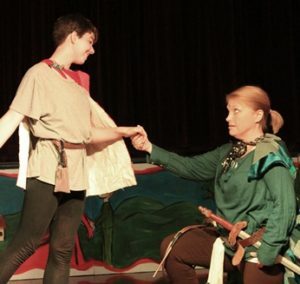 A rollicking tale of heroism and mischief written by Greg Banks, this play’s athleticism and slapstick humor delight adults and children alike. 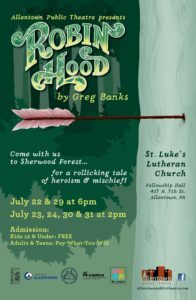 With a largely adult cast, this was APT’s fourth annual summer play for children and families at St. Luke’s Lutheran Church in Allentown. 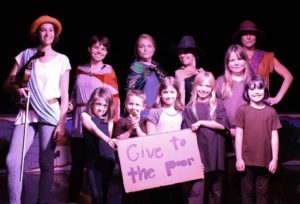 A related series of four Saturday morning theatre arts workshops for children – 10am-noon on June 11, 18, 25 & July 9 – led up to the production. 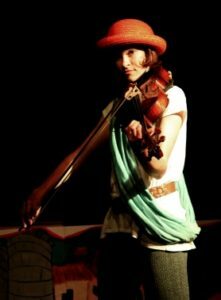 As in the past, children 12 and under were admitted free to both play and workshops. 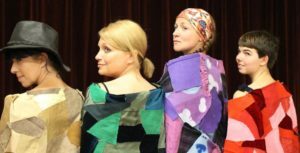 Listen to an interview on WDIY’s Lehigh Valley Arts Salon with Artistic Director Anna Russell and actor Cheryl Moritz HERE! Read a preview article in the Morning Call HERE! Read a review in Lehigh Valley Stage HERE!